A few weeks ago we published what seems like our most popular blog article to date, namely Increased Friction Costs. As it has been our most read article, we thought we might continue to build on the theme of Economic Friction Cost. Williamson (1993) published some work on Transaction Cost Economics (TCE) in a book entitled The Economic Institutions of Capitalism’. TCE is an equilibrium theory and looked more closely at the firm level or micro-level analysis and at behavioural aspects of ‘rational choices’. Up until that point most economists had only considered production cost as part of profit maximisation assumptions, and not at transaction costs within the firm. 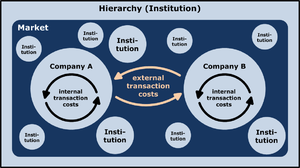 Transaction Cost Economics focuses predominantly on the governance of ongoing contractual relations (Williamson, 2007). But what exactly, in practical terms are Friction Costs? As stated in our previous article there is a large element of hidden costs implicit in Friction Costs. Friction Costs can be highlighted by analysing the end to end or life cycle costs of any product or service. A general rule of thumb that is applied to life-cycle costing is to take the visible ‘advertised’ cost and double it up. That exercise generally gets you very close to the full life-cycle cost of any product of service. This rule of thumb works with large capital projects, as well as estimating the full employment costs of hiring people. But friction costs go further than this. You might call it the fourth dimension of costs as it incorporates time value and opportunity cost elements. Time value in terms of the diminishing purchasing power of money, due to factors like inflation and opportunity costs when money is not put to beneficial uses. This is the general use of the term Time Value of Money and ustilises Present Value techniques via a discount rate to work out the equivalent value of money in today’s purchasing power terms, whether we look into the past or into the future. Thus, the two areas we have to focus on during the expansion of the Friction Cost exploration in the next article will be time value and opportunity cost elements, as part of our enquiry into delving into a better understanding of Friction Costs. Principled making my first post at themarketsoul.com, which seems to be a wonderful forum! Pingback: If you are riding an escalator up and are holding a briefcase. Are you doing any work on it? Why?